Delight your taste buds with this small-group wine-tasting tour from Montreal to Quebec wine country. This tour is a unique winter experience that reveals the secrets behind one of the region’s world-renowned products: ice wine. You’ll take exclusive tours of two wine estates. You’ll be picked up from downtown Montreal or Old Montreal in the morning and be taken by comfortable mini-coach through beautiful Quebec wine country. 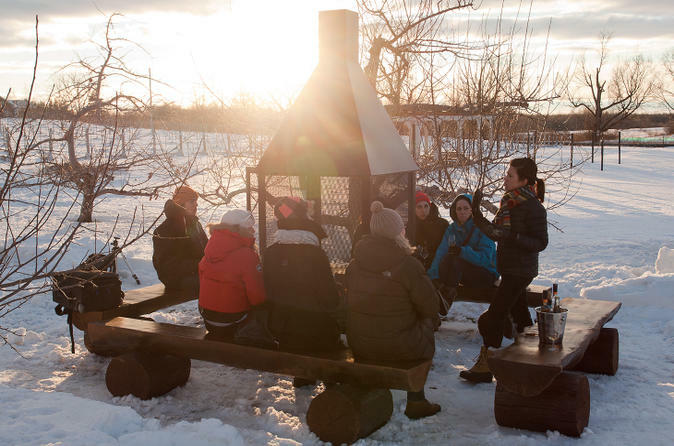 On your unique ice wine tour, you’ll be welcomed by the owners at two vineyards. Start with an ice wine cocktail-mixing class, where you’ll learn tips on how to create the best flavors with this refreshing drink, which is a type of dessert wine produced from grapes that have been frozen while still on the vine. For a more comprehensive overview of this world-renowned product, you’ll be led on exclusive winery tours that aren’t open to the public in the winter. Feel like a privileged insider as you discover secrets about the ice wine-making process that few others know! Follow that up with some tastings of this unique wine.